Rediff.com » Business » Want to succeed? Harvard guru's tips! Want to succeed? 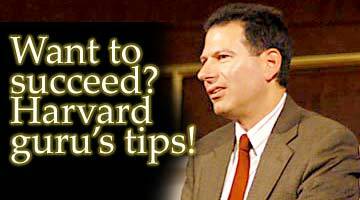 Harvard guru's tips! The world is changing with trade barriers disappearing and competition becoming fiercer than ever. Robert S Kaplan says that to succeed, you have to change the way you operate. Measure performance, think strategy and use the Balanced Scorecard to stir up your organisation. It's worth it. Think of what you say in the presence of the winning team of Robert S Kaplan and David Norton (co-founder and president of Balanced Scorecard Collaborative Inc). When John Thompson, the then president of IBM Canada, after a round of golf declared that he needed a scorecard just like the one he used during his golf game to measure the performance of his business, Norton didn't let it pass. He went to work and emerged with the concept of the Balanced Scorecard along with Robert S Kaplan (Marvin Bower Professor of Leadership Development at Harvard Business School). With their third book together on the way, the duo has successfully created business history with the concept. v) Mobilise change through strong, effective leadership. In an interview with The Smart Manager, Kaplan denies that marketing had anything to do with the success of the much touted management concept. "It is," he says, "all substance." Have you looked at Indian data? So the Balanced Scorecard has a purely US perspective? No, it has a non-Indian perspective because many countries use the framework. Is the framework only useful for large companies with many divisions and SBUs (strategic business units), and offices? We have had great successes at small organisations with as few as 25-30 people because it freed up entrepreneurial energy even in a small group, it even got the senior management aligned. This process is very healthy in bringing people together to accomplish the strategy. The question isn't who is right but what is right. Just collecting the sheer amount of data that the Balanced Scorecard needs must be a huge exercise? All you need is 23 pieces of data. All companies who have done it have reported that less resources are devoted to data collection after the Balanced Scorecard than before. They were able to turn off a lot of reports that were not adding value but they were collecting just to protect themselves. I am not buying into the assumption that there is a lot of data collection to do. If you want to link your high level measures to your transactional system, then you need the software to do the linkage. Mobil got its results running off excel spreadsheets for 23 divisions. Was it trivial to get the data? No. The data was required to implement the strategy, the upgrading of skills. I do not want to leave the impression that the Balanced Scorecard requires tremendous amount of data collection. That is usually a symbol of failure. If a consultant comes in, tell you that it will cost $2mn or $3mn and it will take eighteen months, then you are getting something, but it is definitely not a Balanced Scorecard. For strategic budgeting to succeed, companies must engage in activity-based budgeting. Right? It probably works better that way but not that most companies are doing it. I suspect that the percentage of companies doing activity based budgeting is relatively low. During your research, you found that one of the reasons why some companies find it difficult to implement strategy is their command-and-control management style. In India, management is still pretty much top-down. Please comment. I have been traveling around Asia and have been told that some Asian companies are a lot more authoritarian than, say, American companies. The founder and the family run it, it is their company and managers will do as they say. Those become not very good settings to implement the balanced scorecard. The essence of the scorecard is sharing information. But organisations used to keeping information private and at the top are not accustomed to sharing information widely with their employees. The balanced scorecard tries to tell people what the organisation is aiming to accomplish, to allow people to do their jobs differently, to help the organisation accomplish goals. You have to free up some of the command-and-control structure to allow people to be more innovative to help the organisation accomplish this strategy otherwise you will not get the benefits of the balanced scorecard. India has many family businesses. How well does the Scorecard work in such organisations? At the outset, let me say this is not a technique for large, hierarchical, complex organisations. I understand business groups and a very good friend of mine has done extensive research on family groups. We understand the critical role they play in emerging economies. Having said that, the world is changing for them as trade barriers drop, as import protection drops. Their privileged access to local economies is going to decrease as organisations around the world start to enter their businesses. Conversely, with trade barriers breaking, these companies find a broader set of countries in which they can operate if they operate well, so there will be a huge benefit for them to operate their companies more efficiently. They may need some focus, there may be too many businesses, and they may need a way of assessing which ones are world class and which can operate in the world environment. Increasingly, they will look for tools to help them understand the strategy for success in each of their businesses. Second, financial measures are not enough to measure and guide performance. They are going to need a more comprehensive system, and they will have to train the next generation of managers for these operating companies  managers who think strategically. When they come to this realisation, I think they will find the Balanced Scorecard a valuable management tool. But first, within themselves they need to feel that they need to perform better, need to create more competitive organisations. They should not adopt the Balanced Scorecard because it is a popular approach. They should do it for business reasons. Joel Stern, head of Stern Stewart and originator of the EVA (economic value added) concept, is talking about integrating EVA and the Balanced Scorecard. Is this something companies should be doing? Sure, depends from which perspective. On the Balanced Scorecard, we have high level financial metrics and I like EVA and I get along with Joel and if companies want to use EVA and the Balanced Scorecard, I am happy. I am pleased that they are thinking of this, and we are having conversations about how we can increase value in the market place. School, Professor Michael Jenson, has been quoted as saying, "Just remember that if it is a ratio and if it is a performance measure, you are paying people to do bad things". The Balanced Scorecard is filled with ratios. I think Michael Jenson is getting out of his area of competence when he starts talking about the Balanced Scorecard. I understand ratios and the problems with ratios, but I do not know of what ratios he is talking about. The problem with ratios is that you either increase the numerator which is a good thing, or you decrease the denominator, which can be less of a good thing, so I know how to do the arithmetic. He says that if you have more than one performance measure, you don't have any performance measure. I make a note never to fly in an airplane that Jenson is piloting. I have this image of him flying a plane with a single measure. I don't want to know what that instrument is measuring but I do know that I don't want to be in that plane. Our experience is that senior executives, like pilots, need a good battery of integrated measures to guide their journey through the spaces in which they operate. Has your experience in several countries made any changes to the original concept and what are they? There are different layers of acceptance in countries. To be honest, the concept is going fine in South America, Europe, South Africa, Australia and New Zealand. The biggest changes -- evolution -- come from working with innovative organisations, from seeing their implementation. Country or nationality has not been an issue yet, though it may become. Asia, because of the financial crisis of 1997, had a setback in new management techniques. It went back to survival mode and many of these countries had to scale down. Now they are rejoining the world economy. They are now looking at new management approaches that will once again make them competitive. What has been your experience in Japan? I have not been there on the ground but one of my former students is there and he tells me that the Balanced Scorecard is becoming increasingly popular in Japan. The Japanese are superb in operations but they don't think strategically. But don't Japanese managements have a long term vision vis-à-vis American companies' quarterly approach. . .
Japan thinks long term in the sense of operational excellence. It's one particular strategy: we are going to succeed by being better, faster and cheaper. But they are setting a limit to the success of that strategy. They cannot produce at low enough prices, other countries just will not accept it. How will they modify their strategy in a world where they just cannot outproduce China, Taiwan or India, to strategies that focus on value added processes? It has been very difficult for them, but they are coming around. It's that unique value proposition that you offer. For a while Japanese companies had 'better, faster and cheaper' as their defining strategy, but it cannot succeed for ever. In their book, The Discipline of Market Leaders, authors Michael Treacy and Frederick D Wiersma argue that successful companies create value in one of three ways: product innovation, operational excellence or customer satisfaction. How is strategy more than these three? Japan has been operationally efficient. Strategy is your choice of positioning and it does not have to be specifically related to each of these three. There is value coming out of innovation, thinking of the specific target segment that you are trying to compete in, creating the value proposition, product leadership, customer solutions or good value for money that enables you to succeed. The other hassle with the Japanese is performance mentality. Senior executives are just not used to that way of thinking where you reward people for delivery of performance and punish or not reward people who fall short. The newer breed of managers coming in is more tuned to that management philosophy. How should people be rewarded? When they contribute in line with the organisational objectives. Specifically how they do that is up to them, whether they give cash rewards or rewards other than cash. And how does the Balanced Scorecard fit there? It gives you a more comprehensive set of measures by which you can tie rewards to performance. It gives you a more general definition of performance, not just financial performance. Are stock options a good idea? That is a completely separate question from the area of Balanced Scorecard. I think that stock options have value in aligning individual incentives to the company incentives. There is a cost to the company: stock options are worth more to the companies offering them than the individuals receiving them. Companies could get more cash, more value for the stock options if they packaged them and sold them in the market place rather than give them to employees. Companies are probably overusing stock options but there is a role for stock options. Are some countries better able to adopt the Balanced Scorecard than others? The Nordic countries around Scandinavia love the Balanced Scorecard. It has swept through Denmark, Norway, Sweden, Finland. Somehow its holistic approach seems to match very well. They have a stakeholder perspective of employees, communities and the Balanced Scorecard provides a context. The worst performer? France, because they don't want to take advice from people who don't talk French. They think they invented it fifty years ago but it is actually just a bunch of KPIs (key performance indicators). It has been slow in Italy also, maybe because of what we were talking about earlier, the authoritarian approach of companies. How much of the Balanced Scorecard's success is pure marketing? Very little. It is all substance. One way to judge the maturity of a concept in a country is by seeing who shows up at the conference. If most of the attendees are consultants, you are in the early stage of implementation because they are still trying to get the idea. The data shows that 50 per cent of companies in North America use the Balanced Scorecard. It is sustaining, it is not something that showed up ten years ago and was dropped. And it is expanding. What is your new research on? Enhancing the idea of the Balanced Scorecard. Currently David Norton and I are working on the third book. We believe that important works like Godfather and The Lord of the Rings come in threes, so we are working on the trilogy. It will be on strategy maps. Strategy maps evolved almost in passing while we were doing the Balanced Scorecard, and we realize it is as important a concept in its own right as the Balanced Scorecard was. We want to see what strategy maps look like in various strategies. The author is Managing Editor, The Smart Manager. Published with the kind permission of The Smart Manager, India's first bi-monthly management magazine.